Happy Friday! The end of the week means leaving the desk and getting outside for some different work. Terry (reluctantly) and I will be working on our patio expansion all weekend. We have so many parties and hang outs when it’s warm out that we are really trying to create a space that is ideal and convenient for us and guests during the warm months. By the way, dining on the patio means the mess is outside! So here are the hacks saving my life with the kids this summer. Why didn't I know about these sooner? I have spent the past seven-ish years using plastic grocery store bags for wet items. I actually used plastic grocery store bags a lot. Lunches, odds and ends, wet stuff, etc. I felt like I was reusing them so I was doing my part for the earth. Now that we are all becoming more aware of how harmful they are for the environment the push toward reusable items is really taking off. I try to remember my own reusable grocery bags most of the time and cut down on the old plastic bags. Summer rolled around and I was looking into wet bags for the kids. I got Madeline a super cute one from Pottery Barn Kids, but I neglected to order one for Cameron. Well one day he came from camp and his entire book bag, hat, spare clothes ... everything was soggy. So I hopped online to search for wet bags that I could get in a day or two. I found this awesome one on Amazon. It is super thin, bunches up nice and small, and even has a snap to clip to the outside of his bag. It is keeping the inside of his bag completely dry. He’s happy because he loves the print, I’m happy because it’s all dry, and the Earth is happy. It’s a win all around. There are so many cute patterns. I posted a photo of the Cat in the Hat pattern but there are so many more. I will be buying more for sure. One for every bag that ever goes to the pool for each kid! Note the name label on Cameron's bag! I love these name labels and I posted about them in my very first Mom Hacks post ever! Or park bag, stroller caddy. Whatever. I don't care how old your kids are or if you even have kids. Wipes come in handy all the time. You know how sometimes you go through Starbucks and get the drippy cup lid? It is the worst. Bet you wish you had wipes. 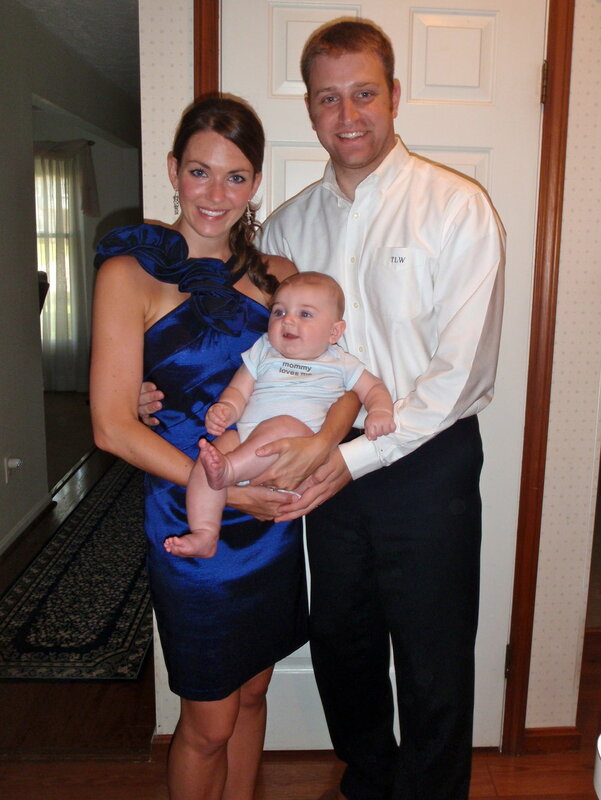 Cameron was a March baby (due in February ... so that was fun) and I remember being so forlorn when I was told he could not use sunscreen until he was six months old due to "all of the chemicals." Turns out this is probably really good advice because the chemicals have given my mom some issues. Meanwhile, what in the devil are we supposed to put on our kids? "Mom, why do I smell like a side of sautéed mushrooms and onions?" At first I tried all this natural stuff and I really hated it. It made my sweet little baby Cam smell like a vegetable being sautéed in olive oil. I love vegetables sautéed in olive oil, but not on my baby. It was greasy and stinky and it made me hate taking him out in the sun. He grew past six months and I thought we were in the clear. Unfortunately, he started to develop a rash to any sunscreen with chemical that I put on his face. I guess this is nature's way of rejecting oxybenzone. Full disclosure: I have finally switched to a full body sunscreen for them. Just this month (finally) after getting back from vacation and talking about Oxybenzone with my mom. (My mom can no longer drink alcohol because of this mess. Nooooo!) I also really need to find a chemical free spray. Spray sunscreen is such a lifesaver. Now that we have it I can't go back to living without it. I found an awesome sunscreen for my kids' faces. It is called thinkbaby and it is mineral based, which means the active ingredient is zinc oxide. Zinc oxide is the stuff that reminds me of the neon Zinka from the 1990's. It has a pleasant citrus-y smell and goes on a lot better than some of the other stuff I tried on poor baby Cam. I have been using it for a few years and it works well. He doesn't get a rash, he doesn't get burned, and he doesn't smell like a sautéed vegetable. You can find it here. You do need to be vigilant about re-applying for a long day in the sun though. I got this sunscreen stick for re-applying. It seems a lot thicker and more white than the lotion, but if I took the time to rub it in it probably wouldn't be that bad. I am just a little lazy after applying it once and I use the stick to swipe and cover my bases. The white zinc oxide is a sign to the other moms that I tried. By the way, Zinka still exists. If you have kids you inevitably spend some time in the sun during the summer. I mean, we all know we are supposed to wear sunscreen daily for anti-aging reasons anyway, but if you are going to spend a couple of hours at the pool or at the park you need some serious protection. UV rays cause cancer and wrinkles and frankly I don't really want either one. I blogged about how I tried the FabFitFun box back in June. I received the Coola sunscreen in this box and I LOVE IT! First of all, usually when I put sunscreen on my face it kind of burns. That cannot be a good sign. Second, it is deep-fryer level greasy and I hate it. Finally, I am trying to avoid any sunscreen with the chemical "Oxybenzone" because my mom thinks it triggered a immune response in her, and I really do not want the same thing to happen to me if I can help it. Honestly, once I started looking at my products, Oxybenzone is everywhere. Evidently it is outlawed in a bunch of European countries. The US is more of the Wild West when it comes to regulating things like this so it is harder to figure out what does NOT contain it, rather that what does. I am a lifetime ingredient reader due to some terrible allergies that I have, but if you have never read a label on food or makeup it may take your breath away. Literally because it's impossible to pronounce half the stuff on there. I really love the Coola sunscreen because it is soooo light, it smells like "white tea" - which is kind of flowery and fancy but in a mild and good way, it doesn't leave a big white film, and it doesn't make my face burn. 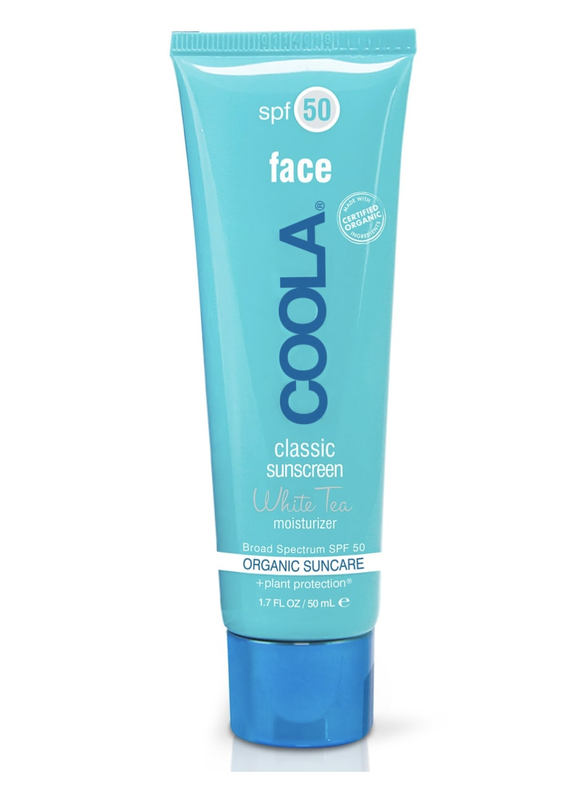 I also - on the tip from a good friend after my sunless tanning post - have the Coola sunless facial tanner. I mix a little pump of this into the sunscreen and apply it when I am just hanging around the house on the weekend. It's nice to have a pinch of color without the damage from the sun. You can click on the photo of it or link to check it out and read the reviews. I just noticed that Nordstrom sells a Coola spray so I ordered it and I'll let you know how it goes. Mamas with wiggly kids need spray! To take it up a notch, I also use the Super Goop translucent finishing powder. It has zinc oxide in it, so I have actually been wearing it daily over my regular makeup this summer. It also cuts down on the oil which my face inevitably produces. I blogged about this before, back when we went to Vegas in the spring, but I really love it and it's worth mentioning again. I recently bought a refill for the brush I bought last summer. I also really love this feature. I am type A and I cannot handle a yard littered with toys. It bugs me that a squirrel or opossum could be gnawing on a squirt gun at 3am and then later that day my kids are squiring each other in the mouth. This is what kids do. This is what squirrels and other woodland creatures do. I don't want to do rabies so I pick that stuff up. I take the dry toys inside and I have a bin inside the door. The thing about summer is that there are like 378 wet toys. All kinds of things and then more things that shoot or dispel bubbles. I used to store these inside the door as well and it just got to be a wet and sticky disaster for all. So I finally got my life together and ordered some toy storage for the outside. Just a little thing I keep on the edge of the patio. That way the kids can come up and fill up their buckets, squirt guns, water canons, or whatever the sticky and wet toy is, and they are not tracking mud, grass, and dirt into the house, it's just there for them to play with. I found this storage box on Amazon and it is doing a great job of containing all the toys. There are a bunch of other options out there as well. By the way, the Nordstrom Anniversary sale started this weekend! Nordstrom puts their fall inventory on sale BEFORE the season starts instead of after so you can already start thinking about your fall wardrobe and what you will want to be wearing while you're having a pumpkin spice latte in a few months.